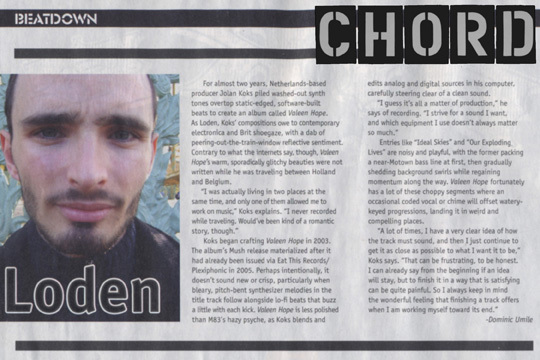 For almost two years, Netherlands-based producer Jolan Koks piled washed-out synth tones overtop static-edges, spftware-built beats to create an album called Valeen Hope. As Loden, Koks' compositions owe to comtemporary electronica and Brit shoegaze, with a dab of peering-out-the-train-window reflective sentiment. Contrary to what the internets say, though, Valeen Hope's warm, sporadically glitchy beauties were not written while he was traveling between Holland and Belgium. "I was actually living in two places at the time, and only one of them allows me to work on music," Koks explains. "I never recorded while traveling. Would've been kind of a romantic story though." Koks began crafting Valeen Hope in 2003. The album's Mush release materialized after it had already been issued via Eat This Records/Plexiphonic in 2005, Perhaps intentionally, it doesn't sound new or crisp, particularly when bleary, pitch-bent synthesizer melodies in the title track follow alongside lo-fi beats that buzz a little with each kick. Valeen Hope is less polished than M83's hazy psyche, as Koks blends and edits analog and digital sources in his computer, carefully steering clear of a clean sound. "I guess it's all a matter of production," he says of recording. "I strive for a sound that I want, and which equipment I use doesn't always matter so much." Entries like "Ideal Skies" and "Our Exploding Lives" are noisy and playful, with the former packing a near-Motown bass line at first, then gradually shedding background swirls while regaining momentum along the way. Valeen Hope fortunately has a lot of these choppy segments where an occasional coded vocal or chime will offset watery-keyed progressions, landing it in weird and compelling places. "A lot of times, I have a very clear idea of how the track must sound, and then I just continue to get as close as possible to what I want it to be," Koks says. "That can be frustrating, to be honest. I can already say from the beginning if an idea will stay, but to finish it in a way that is satisfying can be quite painful. So I always keep in mind that wonderful feeling that finishing a track offers when I am working myself towards its end."